Rivers and streams are affected by polluted stormwater that runs off our developed land. Think about all the potential sources of pollution that runs off our landscapes – fertilizers, pesticides and animal waste from our lawns; leaking automobile fluids and debris, driveway sealant and salt from our driveways, parking lots and roads; sediment and debris from construction activities. Not only are the pollutants harmful to our streams and aquatic life, but the large amount of water that rushes through the storm sewer systems and into the streams erodes banks and causes downstream flooding. Rain gardens help catch and keep rainwater where it falls and encourage water to infiltrate the soil, removing some pollution and recharging the aquifers we use for drinking water. 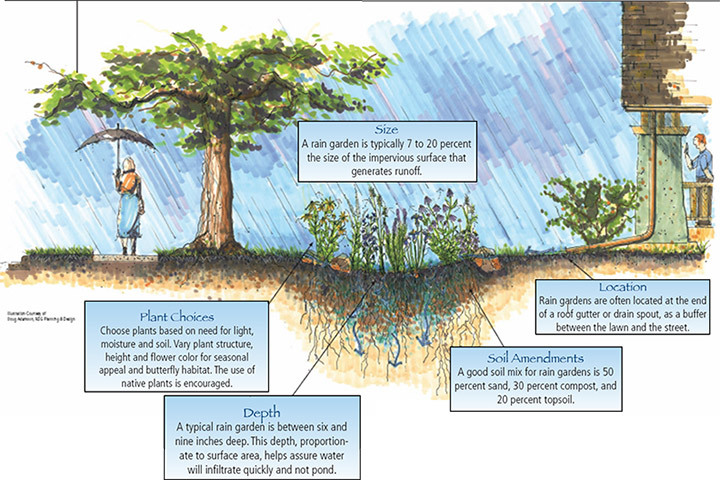 Rain gardens are shallow depressions planted with native plants with deep root systems that are accustomed to wet conditions. You can install a rain garden in an area to which rain already drains, or areas down-hill from your downspouts or sump pump outlet, sloping away from your house.